Kensington's ClickSafe laptop lock uses a single-click locking mechanism to attach to electronic devices without the use of a key. 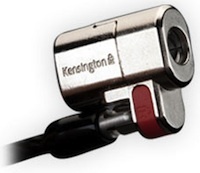 Kensington, a company that offers computer locks, computer input devices, power adapters, chargers and accessories, has rolled out two new locks designed to secure laptop computers, projectors, and other devices equipped with a Kensington lock port. The new locks, dubbed the ClickSafe Keyed Laptop Lock and the ClickSafe Twin Laptop Lock, use injection-molded metal anchors, diecast rotating lock heads, and high-carbon steel cable to secure electronic devices to tables, desks, and other objects. The ClickSafe Keyed Laptop Lock, has one rotating head and secures devices with the help of a loop, while the ClickSafe Twin Laptop Lock ships with two heads and attaches to two devices. A single click locking mechanism that attaches the the locks to electronic devices without the use of a key, ships as a standard feature on both ClickSafe models. Kensington is covering the ClickSafe Keyed Laptop Lock and the ClickSafe Twin Laptop Lock with a limited lifetime warranty and a complimentary key replacement service. The ClickSafe Keyed Laptop Lock is currently available for $49.99, while the ClickSafe Twin Laptop Lock ships for $69.99. Both locks can be purchased with a master key option for no additional charge.